Pergola designs are available in a variety of materials, and styles can be simple or elaborate. 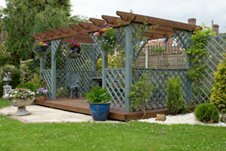 Outdoor pergolas can be attached to another structure (such as a home), or they can be a free standing structure in the garden or landscape. Climbing vines, clinging plants, and hanging baskets filled with flowers make beautiful accents for garden pergolas. Strategically planted flowering plants and exotic climbing vines will cling to pergolas as they grow. They are elegant structures that complement outdoor weddings, parties, and celebrations. Choose a pergola design based on the style of your garden, home, and landscape. Pergola Designs – What Are Your Choices? This type is usually rectangular in shape and made out of wood. Wood pergolas have clean lines, and are painted white or left the natural wood color that will age with time. Traditional pergolas are old-fashioned and romantic, or rustic and warm. Metal pergolas come in a variety of materials, such as steel, iron, and copper. They require little maintenance, and do not need to be painted. Metal pergolas are ideal for sectioning off areas in the yard or garden. Vinyl pergolas are a low-maintenance, long-lasting landscape structure. The vinyl material has the look of wood and the durability of metal. Vinyl pergolas are available in many different styles. They can be square, circular, or triangular (to fit into corners) in shape. Some even have arched or gabled rafters. Vinyl pergola kits can be purchased online or through home improvement stores. Custom designs are also available. Where you decide to place them will depend on the structure of your garden or landscape. 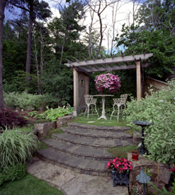 A small pergola can highlight the entrance and/or exit to and from a garden or outdoor space. Incorporate a pergola into a deck, patio, or pool area. Place a pergola near an area used for socializing and entertaining to add style and beauty to outdoor celebrations and events. Create shade in an area that receives a lot of bright sunlight by installing a pergola with a shade or canopy over the top. Add interest and style to an area that is boring and drab. Place over a hot tub or spa. How to Build a Pergola – What Are Your Options? Pergolas can be bought online or in stores; many are sold in ready-to-assemble kits. Installation instructions should be included with any kit you purchase. Small, simple designs are inexpensive to build, easy if you enjoy do-it-yourself installation. Large outdoor pergolas are sturdy, long-lasting, permanent structures. Unless you have experience in the construction industry, consider having these structures built and installed by a professional contractor. You can also search for free pergola designs, plans, and building tips online if you want to learn how to build a pergola from scratch.